Disposal of the used sanitary napkins has been a very common problem everywhere. Girls do not like to carry their used sanitary napkins or maxi pads to a household bin in front of family and friends. She doesn't keep it in normal bathroom bin as it leads to embarrassing visuals and smells. Though sometimes she packs it in plastic bag and drops it in dustbin / bathroom rubbish. The most common way she uses is, flush it into the drain. Both the above way of disposing sanitary napkins creates problems. The flushing in drain results clogging in drain (drainage line chock-ups / plumbing line blocking problems) and throwing in dustbins results health related problems due to hazardous contents in the used sanitary pad. A study says that over 80% girls flush their used sanitary napkins / sanitary pads and tampons because they are messy, bad smelly and embarrassing, which consumes millions of liters of clean water in the toilets. Not only that, it creates blockage is in the sewerage line system and drainage line chock-ups which requires periodically clearing of drainage lines. The correct way to destroy the Used Sanitary Napkins is "Burning" and converting it in Ash. An Innovative technique is invented by a school girl, Aiswarya P; it disposes the used sanitary napkins in public spaces otherwise it would be extremely harmful for the atmosphere if we allow it in open burning. The incinerators were doing the same, though in large numbers. 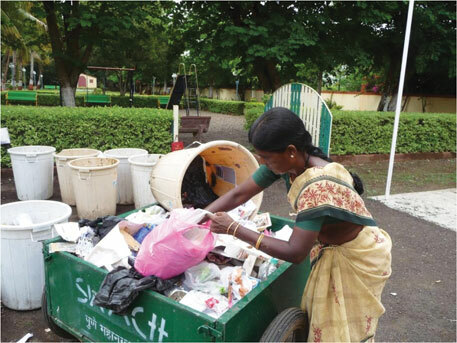 While in class IX, she worked out a simple, low-cost sanitary napkin disposal machine, where the plastic and cotton in the napkins can be cleaned and separated and the cleaned plastic can be recycled and used again. Aiswarya’s new technique is now awaiting Indian patent and during the waiting period, she was honoured with SRITI (Society for Research and Initiatives for Sustainable Technologies and Institutions) UNICEF Award for Inclusive Innovation for Children. Women and Youth last month. She was presented with the award by National Innovation Foundation - India chairperson R A Mashelkar. 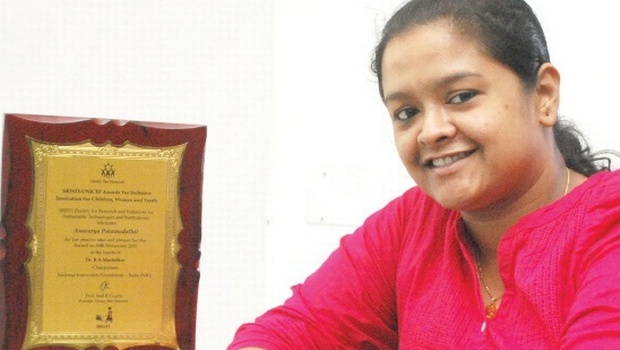 In 2007, her brother Krishna Kanth had received National Innovation Foundation award for low-cost electronic speed-breaker for vehicles and was hailed as the youngest patent holder in India at the age of 14. “My brother’s achievement was very inspiring for me. My parents, retired professor Sujath Kumar and Premaja P, Deputy Director, Agriculture Department, were the guiding force. I continued my research and experiments throughout my BTech course at Adisankara Institute of Science and Technology and came out with the low-cost project, which will be of help to the numerous women, travelling and working and having a busy schedule, who find it difficult to get a proper place to dispose used napkins,” says Aiswarya.